Current: How to Develop As-Is and To-Be Business Process? 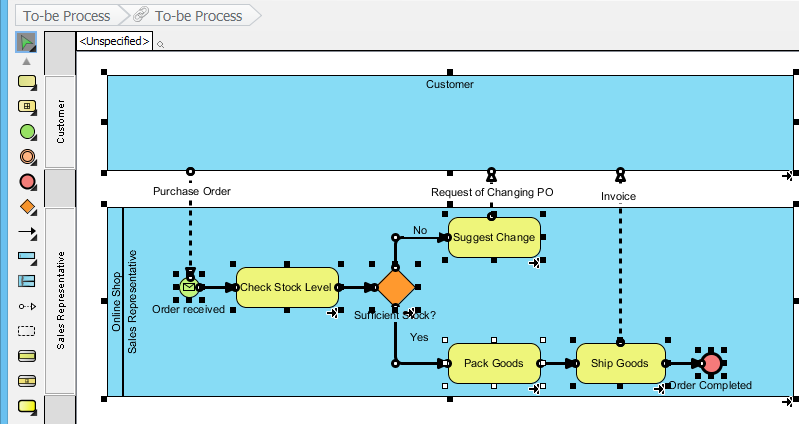 One effective technique for transforming vision into results is to develop and populate an As-Is and To-Be BPMN diagrams. The As-Is diagram describes the present state of the organization's process, culture, and capabilities. The To-Be diagram describes the future state; in other words, how the organization's process, culture, and capabilities will appear in the future. This studying of As-is and To-be process results in identifying the difference between the current and target business state, known as gap, which is an important part of any business process reengineering/improvement initiatve. The main purpose of an as-is diagram needs to work out where improvements are needed and what is the starting point for change. On the other hand, to-be diagram requires business analysts to be creative in solving problems and designing processes to achieve business outcomes, often only based on imperfect information about what the organization actually wishes to accomplish. 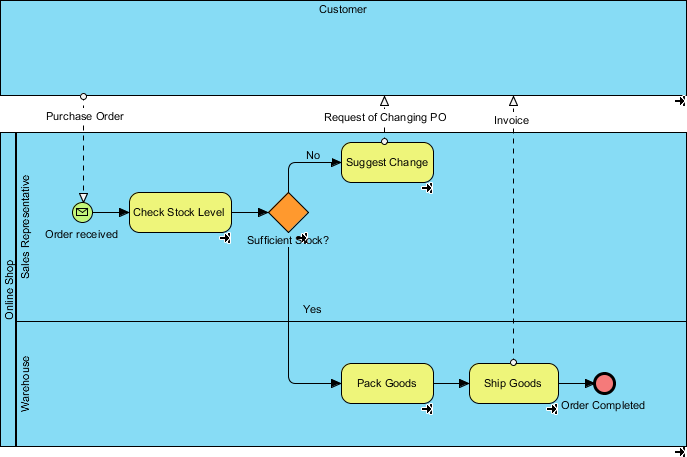 In this tutorial, we will be using Visual Paradigm to create BPMN-compliant business process diagrams. It provides a robust means to capture the current business process, design enhancement and identify the enhancement between the current and enhanced processes. The example that we are going to demonstrate is about an online shop that sells goods. The process begins with the sales representative receives a purchase order from a customer and proceeds to check the stock level. If there is enough stock on hand to meet with the order, the sales representative will pack them. The process ends with shipping them along with an invoice. In case of insufficient stock, the sales representative will suggest the customer to amend the purchase order. We are not going to walk through how to draw business process diagrams using Business Process Modeling Notation (BPMN) here, as we have another tutorial that covers this. 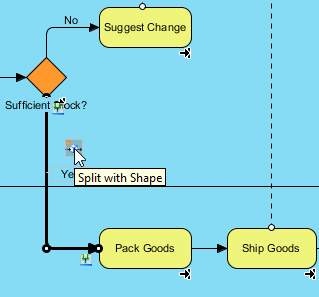 We also include a tutorial video called Introduction to BPMN - Swimlanes here for you as well. Once the business process of your existing operation has been created, you can then derive the to-be process model by considering and projecting the necessary improvements or changes needed to be made based on the existing to-be process. Walk through the steps in this tutorial to see how things work. Download Online-Shopping.vpp. You can also find this file at the bottom of this tutorial. Open the Model Structure tab. 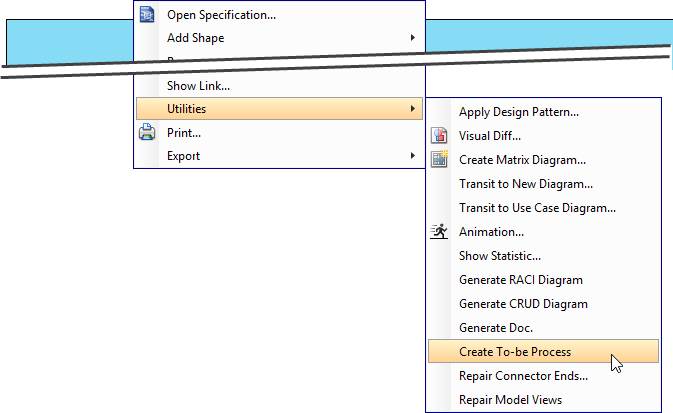 Right click on project root node in the tree on the left hand side and select Model > As-is Process from the popup menu. 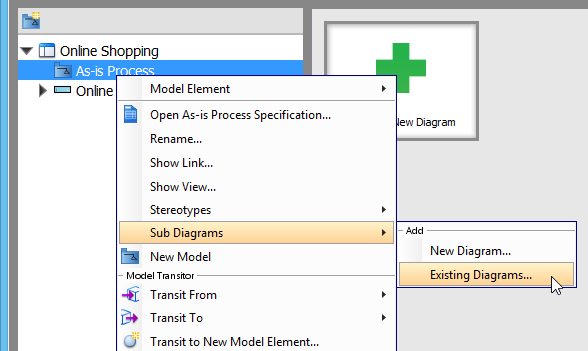 Right click As-is Process and select Sub Diagrams > Existing Diagrams... from the popup menu. 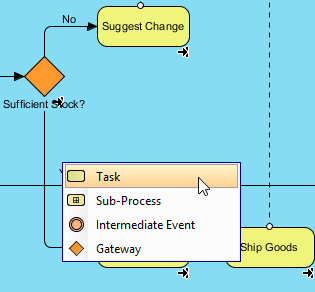 In the Add Sub Diagram window, select the only business process diagram and click OK.
Now your existing process is being contained under the as-is Process model. Let's just say that our business has grown so much that we now have a warehouse to keep our stocks. So we are looking for ways to improve our current (as-is) process to better allocate the new resources. 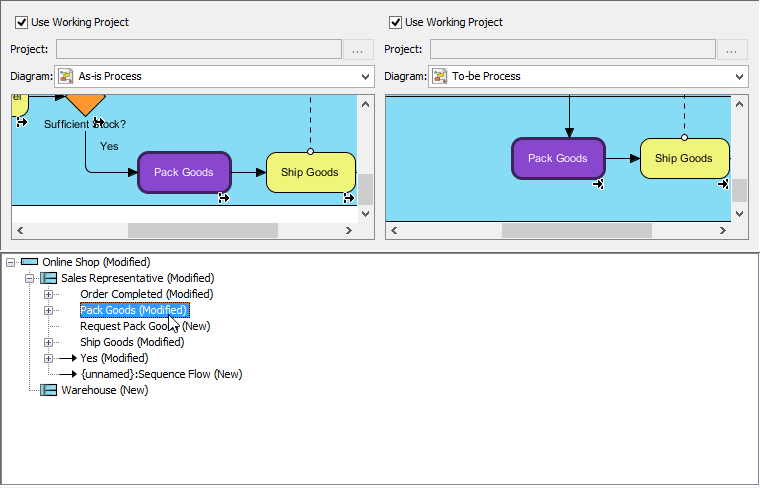 Furthermore, we will show an example of modeling the enhancement below in a to-be process diagram. 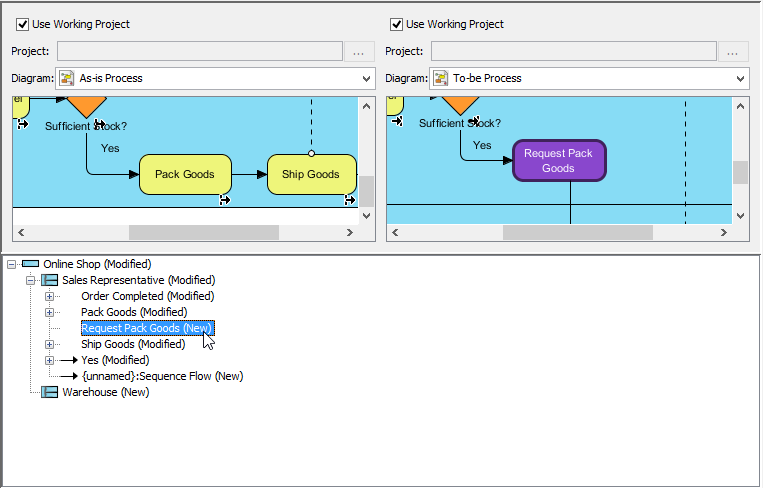 Create a to-be process diagram from the current process diagram. 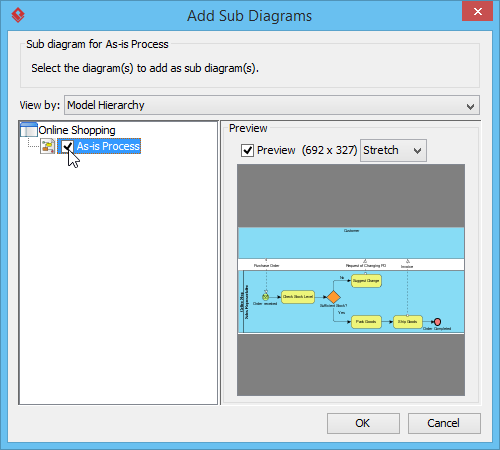 Right click on any white space in the background of the as-is process diagram and select Utilities > Create To-be Process. You'll see that a new diagram is created containing the to-be process. 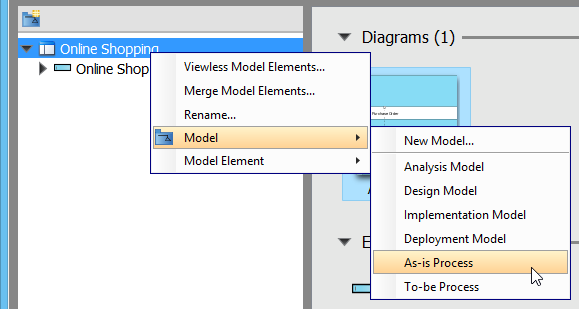 Note: Initially, all model elements are selected in the new diagram. To deselect, click any white space in the background. Add a lane to Online Shop. Name it Warehouse. In the Sales Representative lane, select Pack Goods, Ship Goods and Order completed and drag them to the Warehouse lane. Your diagram should look like the one below. We are going to insert a task between Sufficient Stock? and Pack Goods. Place your mouse pointer over the Yes flow coming from Sufficient Stock? and then click on the resource button Split with Shape. Select Task from the popup menu. Name the new task Request Pack Goods. The completed to-be process diagram should look like something like this. To compare the differences between two diagrams visually, we can make use of a function called Visual Diff. 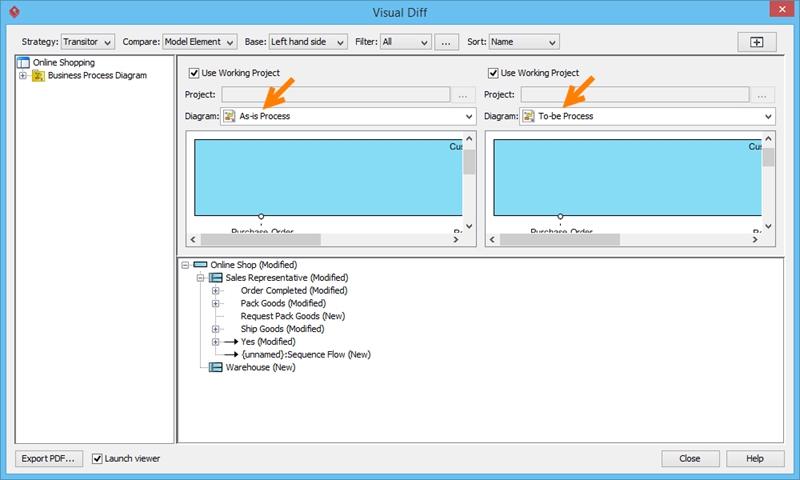 Select Modeling > Visual Diff... from the appliaction toolbar. In the Visual Diff window opened, select Transitor for Strategy. 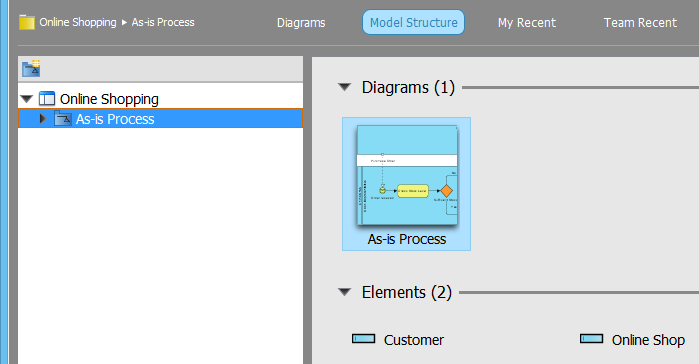 For Compare, select Model Element to be the level to compare our diagrams. Check the checkboxes next to Use Working Project. Select As-is Process on the left. Select To-be Process on the right. The comparison will be triggered automatically. For example, from the list below the diagrams, we know that changes were made to Pack Goods as it says Pack Goods (Modified). If you click on the row, you will see the corresponding changes in purple in the diagrams. New tasks will be noted as well. Remember (in the enhancement) we have added a new task for the sales representative to request for the warehouse to pack goods? That is also "spotted" in our list.